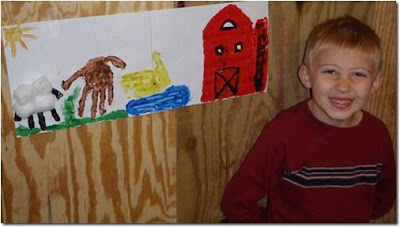 Help kids learn about farms, farm animals, the letter f , counting, and so much more with this fun letter of the week lesson plan for preschool, prek, and kindergarten age kids. 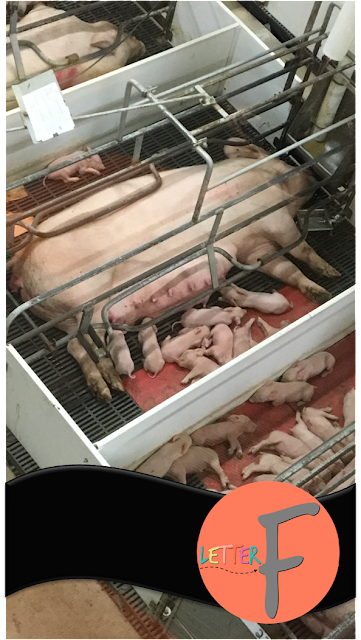 For this Letter F theme you may want to consider taking a fieldtrip to a local farm to let your child meet the animals in person. This way they can truly experience farms with all their senses. Take a big box and turn it into a red barn. You can usually get a large refrigerator box free at an appliance store, just call first. Cut a double door to crawl/enter and paint the walls red. Tape pieces of construction paper to make a roof shape. You can cut out windows if you like. Have your kids bring down any farm stuffed animals to play with them in the barn. 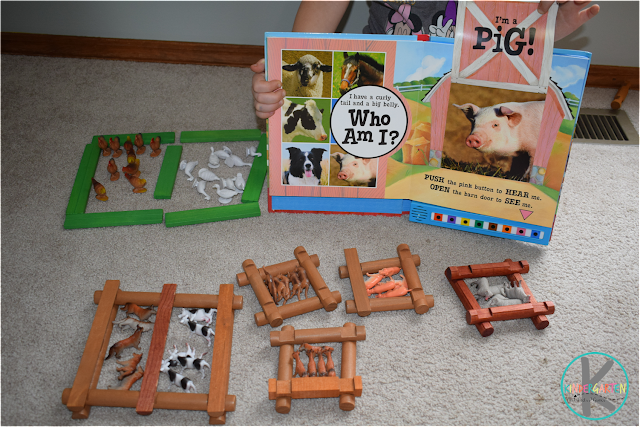 While you play talk about what chores you’d need to do on a farm, what do the animals eat, what kind of environment do they live in, what are baby animals called, etc. You can gather pretend eggs “chickens” left in the barn and use a child rake to clean up the farm. Take turns going in the “barn” and making an animal noise. See if the other person can guess what animal belongs to the noise. 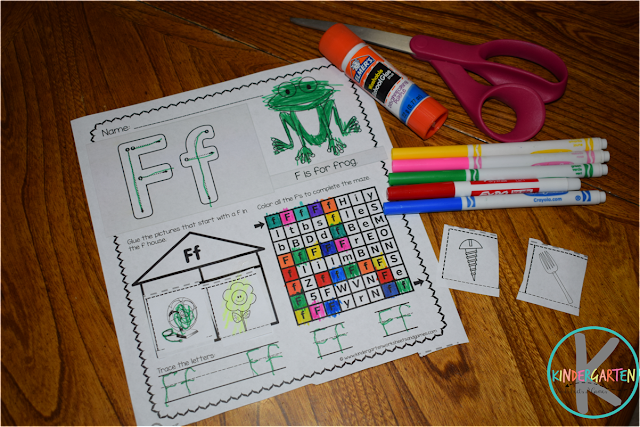 Using these alphabet play dough mats have your child paint the letter F in their favorite colors. Animal Counting – Have your child count different animal combinations. How many brown animals do we have? How many pigs plus cows do we have. Do we have more hens or sheep? Sort the animals by size, color, etc. Egg Counting – Using easter eggs have your child play a memory type game by putting an animal under each egg. You need at least 12 egg halves and 2 of each kind of 6 animals to make this work. Have your child try to find two cows by turning over two eggs at a time – like memory. Math while Cooking – Help your child see how what food comes from the farm to understand the food chain a little better. Bake some bread today – from scratch. Have your child help you measure out the ingredients and count together as you add all the ingredients to turn flour (wheat) into bread. Make a farm sensory bin for your toddler and preschooler to explore. You are going to want a “main” substance such as – bird see, dried corn, dirt (or crushed oreos as dirt so it’s edible), black beans, etc. Add a farm toob to have some animals and tractors to play with. Help your child create some precious art while experiencing the fun sensation of getting their hand painted. Sheep – Paint fingers only black and press on paper upside down. Glue cotton balls on palm area to create body. Make ears on thumb print to make the sheep’s head. Horse – Paint child’s hands brown. Press on paper upside down. Add ears, eyes, and mouth to thumb to make it’s head. Using your child’s finger and broth paint allow them to add a tail to the horse. Duck – Paint child’s fingers and palm yellow. Keeping their fingers close together rand their thumb extended press on paper thumb side up. Add an orange beak and black eye to thumb to make it the duck’s head. Rooster craft. Trace your child’s hand on red construction paper and cut out. It out. Tape the red comb to the top of a white paper plate. Add an orange triangle beak facing down, and 2 google eyes.